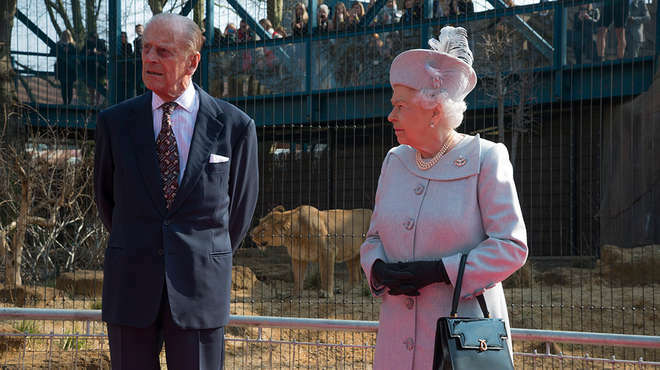 The Royals toured the ZSL London Zoo’s new Land of the Lions, which opened March 17, 2016, and spent time talking to staff about the incredible interactive experiences the exhibit will have on offer to visitors. Lionesses Indi, Rubi and Heidi even showed their respect for the Royal guests – coming to within a whisker of Her Majesty and His Royal Highness in the exhibit’s stunning 360⁰ Temple Clearing. Land of the Lions, a £5.2m development, has been created to transport visitors from the heart of London to the vibrant setting of Sasan Gir in Gujarat, India – the last remaining stronghold of Asiatic lions – and bring visitors closer than ever to the big cats. Covering an expanse of 2,500sqm (27,000sqft), visitors will enter Land of the Lions through a grand stone archway, pick up a ‘park pass’ at the Gir Tourist Information centre and explore Sasan Gir Train Station – where the odd lion might be spotted snoozing on the tracks – before being awed by the exhibit’s incredible centrepiece, a 360° Temple Clearing where the big cats will roam just metres away, separated only by fine wires. To truly capture the essence of the lions’ forest home, the Zoo’s designers visited Gujarat in India for inspiration, and rickshaws, bicycles, sacks of spices, rangers’ huts, and even a life-size truck – much of which was sourced and shipped from India – are dotted both inside and out of the lions’ domain. The external team on this project included Ray Hole Architect and Paragon Creative.